What can be daunting about any radiant heat home improvement project, of course, is where to start. What begins as a simple remodel becomes a full-time job, scheduling contractors, including architects, electricians, and other lay persons for the task at hand. It’s good to know that when you need a radiant heat solutions provider, Warmzone is there with the experts, and the expertise required to tackle literally all of the aspects of a radiant heat project—from the initial consultation, through planning and installation. Warmzone offers up-to-date information about the top quality radiant floor heating and snow melting solutions you’ll need to support just about any radiant heat project. They can design the best solution for you, and direct you to the radiant heat products that best match your needs. Whether you’re interested in heating your driveway, roof or flooring, Warmzone is there to help you complete the job on time, within budget, and to your satisfaction. Of course, the cornerstone of any Warmzone project is its variety of top quality radiant heat products. When you choose Warmzone, you know you are getting cutting-edge radiant heat technology, backed by the best warranty coverage in the industry. ComfortTile floor heating products use state-of-the-art heat cable, which can be purchased in a spool, or pre-spaced and woven into an adhesive-backed fiberglass mesh. Other Warmzone offerings, such as floor heating insulation panels and In-Slab (SlabHeat) cable are incredibly durable and easy to install. And all of these products, and more are backed by industry-leading manufacturer warranties. The size of the Warmzone product portfolio is impressive. From floor heating mats, heat cable and low-voltage heating elements, there are “Best in Class” products available for almost any radiant heat project you can think of. And variety is key, because with the breadth and depth of Warmzone radiant heat product offerings comes freedom of choice. Our experts aren’t just knowledgeable about the products they sell, they understand what it means to meet your expectations and your budget. Rather than taking a one-size-fits-all approach to every radiant heat application, they’ll help you match the best product for your home at the best price. You’ll get sincere, non-biased recommendations and products that are best suited for your particular radiant heating needs. Do you have big home improvement plans but don’t know where to start? When it comes to radiant heat solutions, if you can conceive it, Warmzone can achieve it. Our professional designers evaluate your radiant heating system from top to bottom and create a detailed CAD of your system layout. You’ll know the electrical requirements, technical specifications and system performance expectations before one foot of cable is installed. We even have a master electrician on staff and available to provide technical support. Sure there’s convenience built-in to this approach—we also see it as a sure fire way to minimize any installation surprises in the short term, to save you time and money in the long term. Consider our radiant heat specialists as part of your home improvement project team. We’re here for you from start to finish—to answer your questions, provide you with the appropriate resources, and to follow your radiant heat project through to its successful completion. Perhaps that’s why customers continue to turn to Warmzone, not just for our sage advice but because of our willingness to go the extra mile for our customers. Whether you’re calling to get the answer to a single question, or to get a quote on a radiant heat solution for your home—Warmzone’s knowledgeable, dedicated staff of radiant heat experts is there, offering unbiased information and unwavering support in reaching your radiant heat project objectives. If you are a do-it-yourselfer, not only the depth and breadth of product offerings will make your project easier, but the resources available to you, from start to finish will make your radiant heat project a slam-dunk! Warmzone is your complete resource for radiant heat products, services and installation support for heated floors, roof deicing and snow melting systems. With Warmzone, you’re never more than just a few clicks away from the solution to your radiant heat home improvement project needs. Our customers can visit Warmzone.com, 24/7, for downloadable versions of radiant heat installation manuals, user guides, installation diagrams and more. When it comes to providing radiant heat snow melting and floor heating products and services, no one can match the comprehensive offerings of Warmzone. 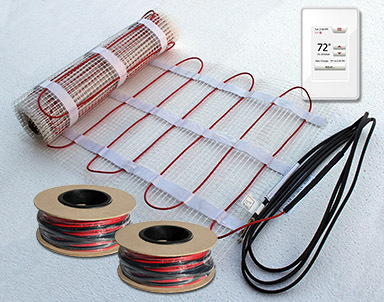 Are you gearing up for that next radiant heat project at home? Don’t wait until the chill hits, contact Warmzone at 888.488.9276 and get started! 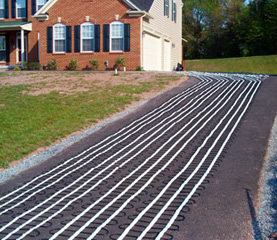 Are you contemplating radiant heat for your next home improvement project? Equipped with high-tech snow switches, radiant heated driveways and gutter systems are fully automated, making them efficient and effortless when it comes to snow removal. 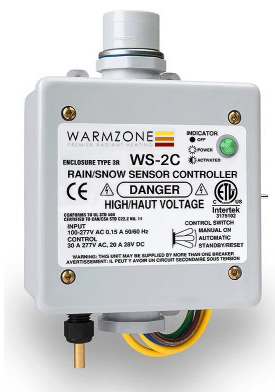 The automated snow switch detects temperature and moisture conditions to initiate ice- and snow melting systems at the first signs of inclement weather. 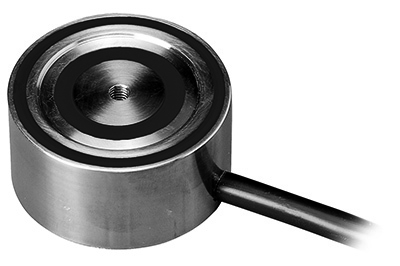 Depending upon what you’re heating, there are two general types of sensors. The aerial mounted snow sensor activates your snow melting system only when needed. These sensors are typically mounted on the roof, and automatically triggers your heated driveway or gutter snowmelt system when it detects precipitation and temperatures are below 39°F. Smart system compatible, the sensor has several other notable features, including adjustable temperature trigger point, adjustable delay off cycle, and upgradeable remote activation. That’s great, you say, but I have a snow removal service already, so why pay for a fancy system? Snow fall is unpredictable. Sometimes you wake up to the stuff, and sometimes it accumulates throughout the day. Snow removal services are certainly very handy, but they can’t compete with the reliability and efficiency of an automated radiant heated driveway system. With an automated radiant heated driveway or gutter system, it’s like having your very own snow melting service on call, 24/7. There’s no waiting involved, and no slippery patches of ice that got overlooked. Automated snowmelt systems only run when it’s snowing, eliminating residual or standby operation costs involved with snow removal services. And most importantly, they offer the peace of mind that comes with knowing your driveway and walkways are completely clear of ice and snow. If you’re not sure how an automated snow melting switch fits into your radiant heat snow melting project, take heart. Warmzone has the experience and expertise you’ll need to meet your project requirements, and can configure an automated snow melting system with your needs and budget in mind. To discover more about radiant heat snow melting systems, contact 888.488.9276 today. Radiant heated roof and gutter heating systems can dramatically enhance the life span of your roof and protect it from damage caused by heavy snow and ice accumulation. Older buildings are a visible testament to the damaging effects of roof ice and snow that can destroy fronts, roofs, drainpipes, and gutters. Roofs that have substandard support structures, and such shortcomings can enable water to enter the building. As technology improves insulation value, there is less heat gain from inside of the building, causing an increased hazard of ice damage and damming on the roof. Once winter frost sets in, damage is often inevitable. 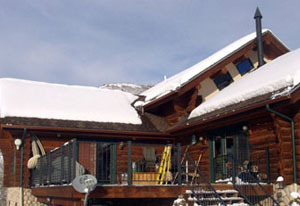 Flat roofs on industrial buildings often give in to excessive weight loads generated by accumulations of ice and snow. This can be prevented by installing a quality heated roof and gutter deicing system, eliminating potential damage from snow and ice buildup. Working with Warmzone on your roof heating system installation allows you to shop a number systems, and find the solution that is right for your home and your budget. Warmzone’s low-voltage roof heating system is another excellent solution for melting snow and ice from roof eaves, valleys, and entire roofs. The RoofHeat STEP deicing system features an extremely thin, self-regulating, semi-conductive polyethylene heating element. Embedded between two layers of vinyl, the panel is protected against UV rays, alkaline or other potential physical damages for durability. What’s great about Roofheat STEP is its versatility. It can be installed under new or existing asphalt, shake, or tile shingles, and is ideal for new construction as well as remodeling projects. Available in rolls 9 or 12-inches wide, the lightweight heating panel can be cut to size, and nailed or stapled through the existing roof, making installation quicker and easier than other traditional roof heating systems. You can never predict the weather, but with a Warmzone roof heating system, you can often predict the outcome. Prepare now and say goodbye to pesky snow buildup and ice damming for good. To find out more about the Warmzone roof heating system, request a FREE quote or contact us at 888.488.9276.